I am so excited about my new client, and if you follow me on Facebook or Twitter, you know that this is also my new favorite boutique and source for dresses - Modern Grace Boutique. What a dream to bring fashion, a boutique, and my work, all together. Grace Mendoza, the owner of Modern Grace Boutique, and I made an instant connection when we met weeks ago. I fell in love with her boutique and with her story (more on that later). This post is about how we gave the Modern Grace Boutique logo a facelift. 1. 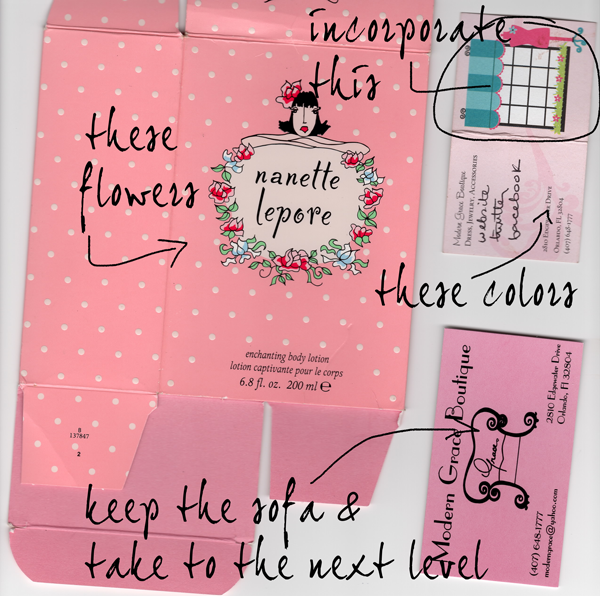 Grace has kept a Nanette Lepore body lotion box for years, because she loves the colors and the flowers in the packaging. She was happy to finally bring out "the box" and share it with someone that could help her make her branding dreams come true. 2. The last batch of business cards and hang tags MGB printed include a graphic provided by an online printer. Grace loved the colors and the elements in the graphic - mannequin, storefront window, awning, etc., but admitted that it has a kind of elementary feel to it. There is nothing wrong with that, if that is what you are going for. We are going for a more adult whimsy. 3. Lastly, Grace actually drew the original Modern Grace Boutique logo (above) when she opened her shop over seven years ago as a way to save money. Her logo is a sofa; giving the sense of a welcoming, non-intimidating boutique. We wanted to keep the sofa, but take it to the next level. First, I searched for a sofa with curvy lines. I chose to make the sofa black and white and put it against a soft pink backdrop. Then I used the current MGB font, Parisian. It's an elegant font and juxtaposes nicely against the curviness of the sofa. The mannequin was necessary to ensure that consumers know that Modern Grace Boutique is a fashion shop, not a furniture shop. Then, there is the window and awning. I used similar colors to those on the latest business card. Then I thought, "Why not put the Modern Grace Boutique logo on the storefront window?" Grace loved this because she actually does have a cream vintage sofa in her store, behind her storefront window. 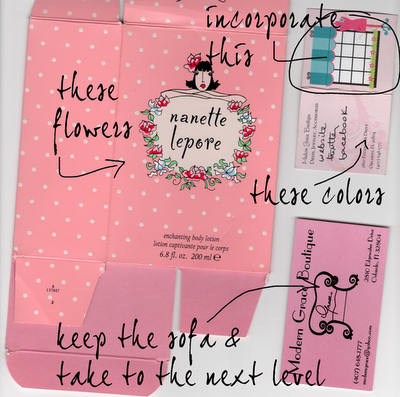 Remember the flowers from the Nanette Lapore packaging? I drew similar flowers to put in the flower box of the storefront window. Since the mannequin looked awkward on the window, I placed the mannequin in front of the window instead, and changed its color from black to the darker pink hue. To add more balance and texture, we added polka dots to the awning and a bar with scrolls to the top. This is the complete logo. However, we will use the simpler version below interchangeably. We are quite pleased with the results. In fact, Grace's words were, "I love it. It's perfect. I want to marry it!" Stop by Modern Grace Boutique's site, like MGB on Facebook, and follow MGB on Twitter. If you live in the Orlando, Florida area, you won't want to miss MGB's specials, events, and great selection. If you don't live close enough to stop by, show a little support to a small business anyway. We LOVE the results! It was actually a great idea to bring back the old sofa - new and improved!